John Sutton, DMA, the Angeles Chorale's Artistic Director, has been with the Chorale since its 2004-2005 season. His professional choral career spans over four decades of work in community, church, academic, and professional settings. From major choral and instrumental works, concert and chamber choirs, to music for television and movies, John is recognized for his work with children, youth, adults, and with amateurs and professionals alike. Today he is one of the most active professional conductors in the nation, conducting over 400 singers and orchestra members weekly. As a student, John studied with some of the most distinguished conductors in the field of choral music. John holds degrees from Northwest University (B.A. in Sacred Music and Biblical Literature), San José State University where he was a student of Dr. Charlene Archibeque (MA in Choral Conducting), and the University of California, Los Angeles, where his mentoring professor was Donald Neuen (DMA in Choral Conducting). He continues to actively study with both Dr. Archibeque and Professor Neuen. Beyond his focused choral training in the university setting, John has studied and performed with notable choral luminaries such as Robert Shaw, Helmuth Rilling, Eric Ericson, Weston Noble, Frank Pooler, Howard Swan, Paul Salamunovich, Anton Armstrong, Eph Ehly, Jerry Blackstone, and others. In addition, he has performed extensively throughout the United States and abroad in choral concert tours and recording projects which include performances at the Kennedy Center, Lincoln Center, and Constitution Hall. He has conducted international concert tours with church and university choirs throughout Canada, Eastern Europe, Latin America, and South Korea. In 2011, Dr. Sutton led choirs on concert tours of Argentina and the Southern United States. 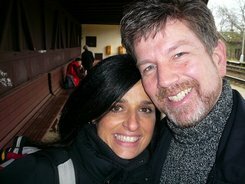 In 2012, John prepared choirs from the United States and United Kingdom for performances at the Britannia Music festivities in Birmingham and London, England. 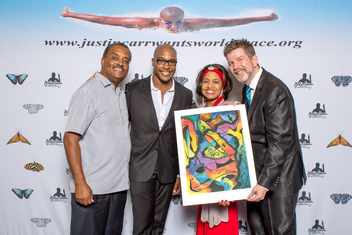 John Sutton with Darrell Carr, Darnell Abraham (soloist), and Eyvonne Williams (soloist) at "Unbridled Joy: An Evening of Gospel and More" a concert in memory of Justin Carr in September 2014. His enthusiasm for the choral arts and his commitment to excellence has made him a popular choral clinician, festival conductor and adjudicator, leading workshops for the American Choral Directors Association, the National Association of Church Musicians, American Christian Schools International, Choristers Guild, the national Conference on Liturgy and Worship, the Mount Herman Summer Choral Camp, and many others. In January of 2010 he was the featured speaker at the National Association of Church Musicians, Mid-Winter Conference. In 2011, John was the featured clinician for the Lake Tahoe “Summer Sing,” and in June 2013 he was the featured clinician and guest conductor at the Exultate Deo Choral Festival in Buenos Aires, Argentina. In 2014 and 2015, John conducted concerts and led choral festivals and workshops throughout Texas, North Carolina, Oklahoma, Arizona, and New Mexico. Since moving to Los Angeles in 2000, John has conducted choral music heard on weekly television series, and national ad campaigns for major motion pictures such as the Harry Potter series, the Spider Man series, The Da Vinci Code, Fantastic Four, and countless others. In 2005, he was appointed as the Music Director/Conductor for the Los Angeles Philharmonic’s annual Holiday Sing-Along. His relationship with the L.A. Phil has resulted in Hollywood Bowl performances with pop singer Barry Manilow (2009) the legendary Italian composer Ennio Morricone (2009), Barbara Streisand (2012), and Walt Disney Concert Hall performances with Julie Andrews (2012-13). Most recently, John prepared the Angeles Chorale for a Hollywood Bowl concert with the Los Angeles Philharmonic in an evening of music dedicated to the composers of China (July 2014). 2010 marked Dr. Sutton being named as the Artistic Director of the Angeles Chorale, and being selected as the Azusa Pacific University (APU) nominee for the national Arlin G. Meyer Award for Outstanding Musical Performance. In May 2014, Dr. Sutton was the inaugural recipient of the Faith & Fine Arts Award, presented by the APU’s College of Music and the Arts. John is an Associate Professor at APU in the College of Music and the Arts, where he leads and gives vision to the entire choral program as the Director of Choral Activities. He conducts the Oratorio Choir and the University Choir and Orchestra, in addition to teaching classes in conducting and Church Music. He has served the students of APU since Fall 2000. Dr. Sutton continues to lead and consult with the choral and worship programs at Lake Avenue Church in Pasadena, where he has served since Fall 2000.